Earn 10,000 points after you spend $1,000 on purchases within the first 3 months. Terms Apply. The Amex EveryDay® Credit Card from American Express (a SmartAsset advertiser) is one of the few American Express credit cards that offers access to the Membership Rewards® program usually reserved for charge cards only (cards in which you cannot carry a balance). The rewards program offers participants a bevy of options to redeem points, and the card offers several opportunities to amass points quickly for no annual fee. 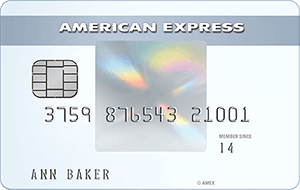 Upon first receiving the card, users of The Amex EveryDay® Credit Card from American Express can earn 10,000 points by spending $1,000 within 3 months. In addition, users of the card can earn 2x points on their first $6,000 worth of purchases from U.S. supermarkets (1x afterward), and 1x on other eligible purchases. Furthermore, by making 20 or more purchases in a single billing period, you can earn an additional 20% in points. All of these points can then be redeemed on travel, online shopping, gift cards, entertainment, dining, etc. or can be transferred to airline rewards programs like Delta SkyMiles® or hotel rewards programs like Hilton Honors®. In addition to those looking for reward points, The Amex EveryDay® Credit Card from American Express may be attractive for those with outstanding debts on other high APR cards. With its introductory offer of 0% APR on purchases and transfer balances, The Amex EveryDay® Credit Card from American Express allows you to transfer debts still owed on other cards (for a transfer fee of $5 or 3% whichever is greater) and pay them off interest-free for 12 months. Remember, though, that after the introductory period, the APR increases from 0% to 15.24% - 26.24% Variable (depending on your credit score), so it is safest to pay back any debts before the end of the 12 month period. Furthermore, there is no annual fee for the card, providing more reason to transfer outstanding debt onto it. As long as you remain in good standing with American Express for the full year (otherwise you may lose access to this deal), you should be able to save a lot of money on interest. The combination of opportunities to earn and redeem Membership Rewards® points, no annual fee, and a 15 month introductory period with 0% APR (afterward 15.24% - 26.24% Variable) could make The Amex EveryDay® Credit Card from American Express a safe option for your credit card needs.